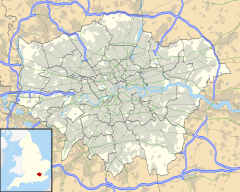 This article is about the area of central London. For the hospital, see St James's University Hospital. For other uses, see Saint James (disambiguation). St James's is a central district in the City of Westminster, London, forming part of the West End. In the 17th century the area developed as a residential location for the British aristocracy, and around the 19th century was the focus of the development of gentlemen's clubs. Anciently part of the parish of St Martin in the Fields, much of it formed the parish of St James from 1685 to 1922. Since the Second World War the area has transitioned from residential to commercial use. The area's name is derived from the dedication of a 12th-century leper hospital to Saint James the Less. The hospital site is now occupied by St James's Palace. The area became known as "Clubland" because of the historic presence of gentlemen's clubs. The section of Regent Street (colloquially known as 'Lower Regent Street') that runs between Waterloo Place and Piccadilly Circus has been officially renamed 'Regent Street St James'. St James's was in the ancient parish of St Martin in the Fields in the Liberty of Westminster. Attempts made in 1664, 1668 and 1670 to separate St James's from the parish were resisted by St Martin's vestry. The building of St James's Church, Piccadilly in 1684 forced the issue, and a new parish of St James within the Liberty of Westminster was created in 1685. The parish stretched from Oxford Street in the north to Pall Mall in the south. It roughly corresponded to the contemporary St James's area, but extended into parts of Soho and Mayfair. Land south of Pall Mall remained in St Martin in the Fields' parish, and St James's Park was split between the parishes of St Martin and St Margaret. St James's Palace was an extra-parochial area and not part of any parish. A select vestry was created for the new parish. For elections to Westminster City Council, the area is part of the St James's ward. The ward includes Covent Garden, Strand, Westminster and part of Mayfair. The ward elects three councillors. St James's is bounded to the north by Piccadilly, to the west by Green Park, to the south by The Mall and St. James's Park, and to the east by Haymarket. St James's Square, which retains many of its original houses but is mostly in office use. The London Library is located there. Jermyn Street, an upmarket retail street best known for bespoke shirtmakers and shops offering the finest gentlemen's attire. Pall Mall, which contains many of London's gentlemen's clubs. It is also home to Marlborough House, the seat of the Commonwealth Secretariat, and the Québec Government Office in London. Crown Passage, a narrow street which splits off from Pall Mall opposite Marlborough House and is home to the Red Lion, one of the oldest pubs in London's West End to still be in business. Haymarket was once the best-known centre of prostitution in London, but no trace remains of this. It contains two historic theatres: the Haymarket Theatre and Her Majesty's Theatre. Carlton House Terrace, a pair of grand terraces of houses designed by John Nash overlooking St. James's Park. St James's Street, which runs down from Piccadilly to St James's Palace. The following utilises the generally accepted boundaries of St James’s, viz. Piccadilly to the north, Haymarket and Cockspur Street to the east, The Mall to the south and Queen’s Walk to the west. St James's is a predominantly commercial area with some of the highest rents in London and, consequently, the world. The auction house Christie's is based in King Street, and the surrounding streets contain many upmarket art and antique dealers including Colnaghi, Agnew’s Gallery, Moretti Fine Art, Hazlitt, Gooden & Fox, Stoppenbach & Delestre Ltd, The Sladmore Gallery and S Franses Ltd.
BP is headquartered in St James's. Office space to rent is the most expensive in the world, costing up to five times the average rents in New York City, Paris and Sydney. The area is home to fine wine merchants including Berry Brothers and Rudd, at number 3 St James's Street. Adjoining St James's Street is Jermyn Street, famous for tailoring. Some famous cigar retailers are at 35 St James's Street, occupied by Davidoff of London; J.J. Fox at 19 St James's Street and Dunhill at 50 Jermyn St.
Shoemaker, Wildsmith, designers of the first loafer, was located at 41 Duke Street but is now at 13 Savile Row. Art galleries catering for a spectrum of tastes occupy premises in the area. The White Cube gallery, which represents Damien Hirst and Tracey Emin, opened in Duke Street before moving to Hoxton Square. In September 2006, it opened a second gallery at 25–26 Mason's Yard, off Duke Street, on a plot previously occupied by an electricity substation. The gallery is the first free-standing building to be built in the area for more than 30 years. Other notable modern and contemporary art dealers in the St James's area include Helly Nahmad Gallery, Paisnel Gallery, Bernard Jacobson Gallery, Thomas Dane, Whitford Fine Art and Panter & Hall. 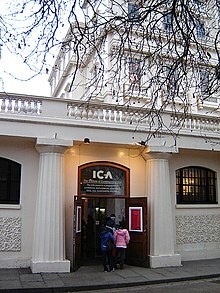 On the southernmost border of St James's is The Mall where The Institute of Contemporary Arts and the Mall Galleries are located. St James's is home to many of the best known gentlemen's clubs in London, and sometimes, though not as often as formerly, referred to as "Clubland". The clubs are organisations of English high society. A variety of groups congregate here, such as royals, military officers, motoring enthusiasts, and other groups. In 1990, the Carlton Club, traditional meeting place for members of the Conservative Party, was struck by an IRA bomb. ^ "City of Westminster ward population 2011". Neighbourhood Statistics. Office for National Statistics. Retrieved 15 October 2016. ^ Mills, A.D. (2001). Dictionary of London Place Names. Oxford University Press. ISBN 978-0199566785. ^ "Pall Mall; Clubland | British History Online". British-history.ac.uk. 23 May 2015. Retrieved 29 May 2015. ^ "The Parish and Vestry of St. James | British History Online". British-history.ac.uk. 24 May 2015. Retrieved 29 May 2015. ^ "Boundary Map of Westminster St James CP/Vest". Visionofbritain.org.uk. Retrieved 29 May 2015. ^ "St James's Ward Profile : July 2013" (PDF). Westminster.gov.uk. Retrieved 29 May 2015. ^ "Westminster City Council". Westminster.gov.uk. Retrieved 29 May 2015. ^ "British History Online - Duke of York Street". Retrieved 11 October 2017. ^ a b "British History Online – Piccadilly, South Side". Retrieved 11 October 2017. ^ "British History Online – St. James's Street, East Side". Retrieved 11 October 2017. ^ "British History Online – Cleveland Row". Retrieved 11 October 2017. ^ Campbell, Peter (19 February 2013). "West End has the most expensive office space in the world costing more than double New York's 5th Avenue, Paris and Sydney | Daily Mail Online". Dailymail.co.uk. Retrieved 29 May 2015. ^ "History : Royal Opera Arcade". Royaloperaarcade.com. Retrieved 29 May 2015. St James's Westminster, Part 1 – a volume of the Survey of London which provides a very detailed architectural history of most of St James's. However a few sections of the parish of St James's fall outside the district, so they are omitted (map). This page was last edited on 19 March 2019, at 10:46 (UTC).